BirchBox - Unwrapped from the outer shipping carton. As you can see, the box is very cute! I love the natural cardboard against the vibrant pink and shimmery gold stripes. It looks like it is wrapped neatly with strips of ribbon. Also, the box is very sturdy, and as I've found, useful for holding lots of other things! I'm using them to separate small art supplies. I just love packaging that can be recycled and used elsewhere! 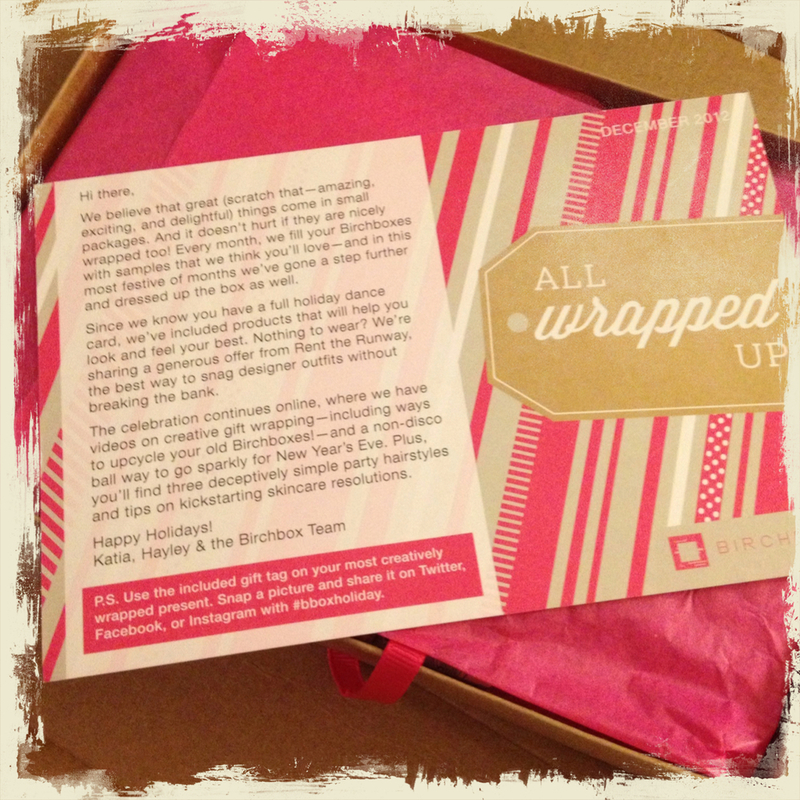 BirchBox - Opened with greeting on top. After much anticipation, I dive in. Inside they have covered the gifts with lovely pink tissue paper along with a greeting card that has information about each sample. The card itself is well designed, mimicking the same gold and pink ribbon from the outside of the box. Finally, I pull back the tissue paper to see what I've been sent. Since this was the December box, they wrapped a perfume & other shampoo samples with some coordinating tissue paper and tied it with a pink ribbon. I love this personal touch. It makes it seem even more special, as you know that someone had to wrap this with tissue paper and tie the ribbon by hand. It also feels like you're unwrapping a second present. Evidently, there are a TON of these subscription services out there, each with their own unique packaging. SubscriptionBoxes.com provides user reviews and collects information as to the pricing, images of the boxes and/or the contents, and other info, ranking them according to the user reviews. They have them categorized by type. MySubscriptionAddiction.com does the same thing as SubscriptionBoxes.com, but they also list out any coupon codes that the subscription services are offering at the moment. What kind can you get? There are art boxes, culinary boxes, kid boxes, baby boxes, fashion boxes, craft boxes... The list goes on! Some have full size products, some are just samples, and as I've discovered with BirchBox, some have a mix of both. BirchBox worked well for me, as it was only $10 a month, and as long as I receive a full size sample once in a while, I might just keep subscribing. Oh, and did I mention that they have a BirchBox for Men? It's $20 a month instead $10, but I'm assuming that is because samples for men are not as plentiful as samples for women. Who doesn't like getting gifts in the mail (even if they've paid for it themselves)? And from a design perspective, I think it's kind of neat to see the innovative packaging that is being used for the samples. I'm so used to the typical vials of perfume and little tiny lipsticks that it's nice to see companies choose packaging that not only makes it a little easier to apply the product, but also gives you a little bit more to sample than a paper thin layer of eyeshadow or blush. But that's a whole other blog post! Check out one of these services, even if for only a month. It's a lot of fun! It's hard to believe that it has been less than 3 years since the first iPad was released. I remember a friend of mine mentioned that Apple was creating a tablet and I thought it was a little ridiculous at first. Sure it could do more than my Blackberry (It's what I had at the time), but I had a laptop. I didn't need something THAT small. It's a waste of money, and what could I possibly do on there that I couldn't do on the devices I already had? Like many, I was glued to my computer, watching Steve Jobs introduce the iPad to the world. It was sleek, easy to use, and boy did I want one after seeing that! I've seen this conversion happen many times. The same thing happened when I bought a MacBook Pro and showed it to other PC users. We go from refusing to even consider it, to upgrading every time a new one is released. When I first started design school, I was going to be one of the ones that didn't make the conversion to Mac. But look at me now with my iPhone, iPad, and MacBook! Yes, I bought into this one too. I just purchased an iPad Mini. "Really Jen?" Some of you may be thinking that I have some sort of Apple addiction. I can quit anytime I want! ...No, I can't. Who am I kidding? I'm going to buy every new device, and I will have an excuse for why I need it, and that's okay, as long as I don't spend every last penny that I have buying them. That being said, when I first bought the iPad, I bought into the idea that bigger was better, purchasing the 64gb WiFi tablet, and actually resisted purchasing any of the 3 new iPads that followed it. But in the last 2-1/2 years, I have NEVER filled the storage and have barely used even half of it. Unless you're planning on going on a long trip, where you require a bunch of music, movies and books on one single device to keep you company, I don't think you need that much storage. I'm not the first to say this, but this is my story, so I felt it necessary to tell you this part. This time, I went with the 16gb WiFi iPad Mini, which I think will be perfect for what I use it for. I tend to use my iPhone for any music storage and listen to Pandora on my iPad. It's what works for me. I have always been fascinated with those that are able to create beautiful paintings on their iPad. (Check out David Brasgalla's Pixelhuset) Not only are these people talented, but they were able to overcome the difficulties I found in using an iPad for this purpose. When I draw or paint, I have a tendency to lay my hand down on the paper or canvas. This habit needs to be broken if you are painting on a standard size iPad, as each touch to the screen adds a new brush stroke. Some have created fingerless gloves to wear or created foam hand rests to avoid this issue, but I just don't draw well with a glove on my hand and well, I just found the link to the foam hand rest, so I hadn't thought of that one. The iPad Mini changes all of this for me. The screen is small enough that I can keep my hand off to the side and use the stylus to reach across, allowing me to keep my hand planted on the desk or table. It just feels natural to me. The screen is also large enough that I can see more of what I'm drawing. I have tried drawing on my iPhone and although it worked better for me than the original iPad, it was still too small for painting. I can't tell you how exciting it is to find a tool that works so well for what I need it for, but also it is so light and small that I can easily throw it in the front pocket of my purse and take it with me everywhere. The original iPad was about 1.5 pounds and the iPad Mini is a little over 1/2 of a pound. Game changer! Also, if I can get over the initial learning curve with painting on it, I will have less mess to worry about. I'll never give up drawing and painting by hand, but it will be nice to do so when I don't feel like cleaning the graphite smudges from my hands and around my drawings, or cleaning the paint out of my brushes. In the coming weeks, I will be trying to get over the learning curve of painting on my new device and looking at various apps to use for this purpose, both vector and raster. Stay tuned!